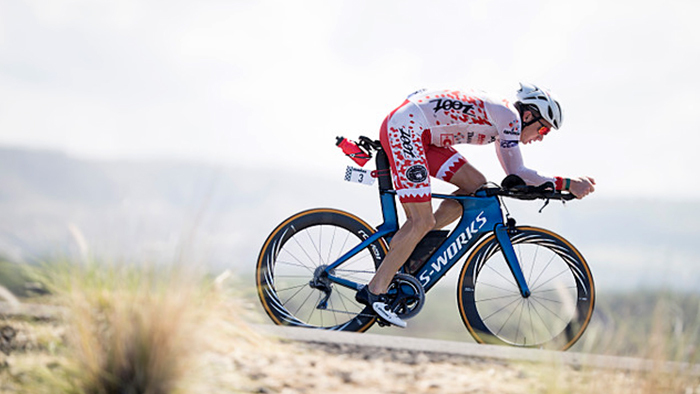 Top-ranked U.S. pro triathlete Ben Hoffman is a familiar name to many in the sport. 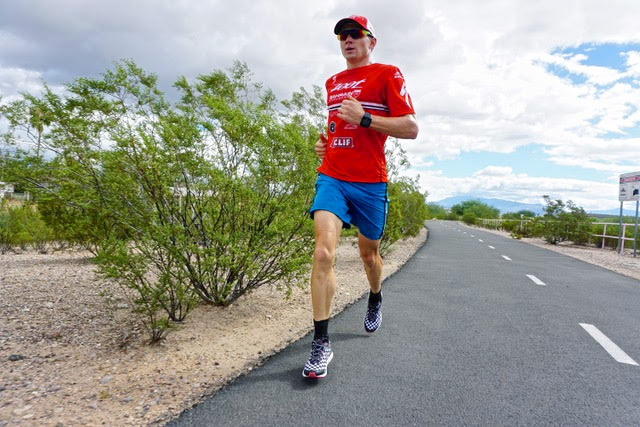 A professional since 2007, Ben has achieved second and fourth-place finishes at Kona, won IRONMAN South Africa the last two years, and been ranked the #1 or #2 IRONMAN athlete in the U.S. for the last several years. Hoffman is a huge fan of data-driven training, and is a true student of the sport in every way. Olympic silver medallist Dotsie Bausch is no stranger to data-driven training herself. The seven-time U.S. National Champion, former world record holder and two-time Pan American gold medal winner was featured in the documentary “Personal Gold: An Underdog Story,” which outlines how she and the other members of the 2012 U.S. Women’s Track Cycling Team (in light of the men’s team ban from competition surrounding the Lance Armstrong scandal) found success using data-driven training methodologies. We were lucky enough to have Ben slow down from his intensive off-season training to meet up with Dotsie and share a few insights about his training habits, new technology he’s using and some tips he has for other athletes for how to keep overtraining and nutrition under control. Dotsie Bausch: What was your average training week like in 2017? 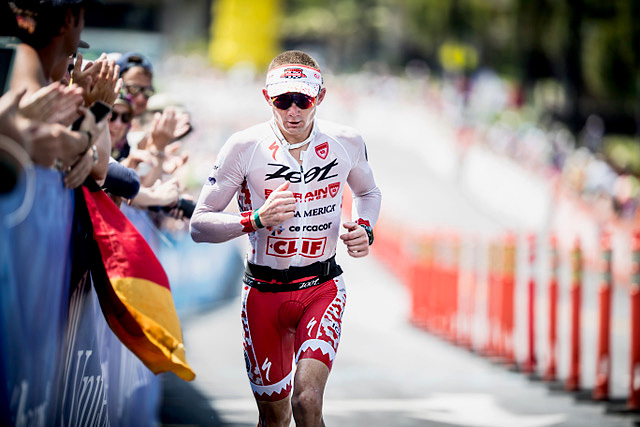 Ben Hoffman: I am mostly classified as a “volume responder” type of athlete, and my training and racing typically displays that. I will ride approximately 18 hours, run about eight hours, and swim seven hours during my average training week, which will also increase as I enter the biggest blocks. Other workouts such as weight training and stretching are also part of my weekly routine. DB: What does your diet look like each day? BH: I am fortunate to have my wife, Kelsey, on my team to handle most of my meals. She truly enjoys creating healthy food. I am also proud to be supported by CLIF Bar, and normally enjoy a nut butter bar before my swim workouts in the morning. I eat breakfast immediately after swimming and that consists of eggs, avocado, toast and maybe yogurt. Lunch varies but always includes a salad. Dinner is early and a balance between a healthy protein, some sort of grain and a colorful salad. DB: What are some of the most important things you learned in 2017 about your body, training, performance and anything else? BH: Having new technology to help me to understand my body and assist me in making decisions in my day-to-day training and racing has been extremely interesting. To have scientific data in your hands, helping highlight reasons why you might be feeling a certain way in the morning, or after a hard workout, is incredible. There always seems to be something new to discover about yourself and your inner workings in this realm and at the highest level in sport, it is all about honing in on these details. DB: Have you changed anything to your training plans and in the way you work with your coach? BH: We share data over the phone, email, and through my training schedule online. My coach, Ryan Bolton, has been amazing with providing feedback throughout the training cycle. 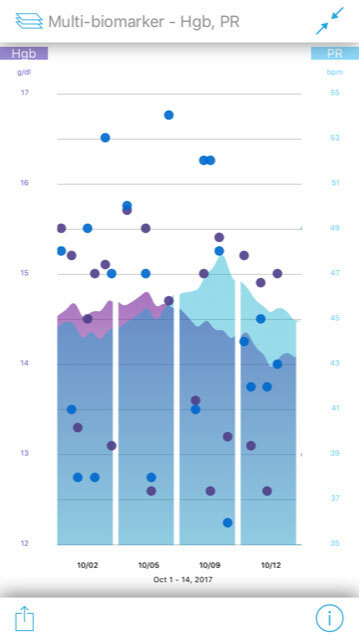 DB: What technology has had the biggest impact on your training and performance? BH: As I mentioned before, technology has opened up a new window for athletes to learn more about themselves and their body during the entire cycle of resting and training. I’ve been using the Ember device by Cercacor, the non-invasive hemoglobin tracker, since early 2017. It is the only piece of technology that offers me instant readings of a wide variety of parameters, including: hemoglobin, pulse rate, perfusion index, oxygen saturation, oxygen content, respiration rate, pleth variability, and now carbon monoxide and methemoglobin. Those last two can impair hemoglobin’s ability to carry oxygen. Having this personalized data available anytime I want in just 30 seconds, is beyond valuable when trying to understand how to help my body reach its fullest potential. DB: What are your challenges with overtraining? BH: Overtraining is always a major concern. Hitting the bike, road and pool between 35 and 45 hours a week puts a huge strain on my body. And, of course, those of us who train harder usually go faster—the end goal. I have to keep a very close eye on how I’m feeling and not cross that invisible line. I often come close. It’s certainly happened to me in my career, but besides causing me to feeling run down, overtraining majorly disrupts my routine. I find Ember very useful in learning more about how my body best recovers and repairs. The data helps to smartly guide me to better recovery. Once I established my baselines, I then consistently measure my parameters. I can see if I am above or below where I should be a day after a hard workout. I have a much better idea about how close I may be getting to my personal wall and am better equipped to avoid hitting it. DB: What parameters do you measure? Which ones do you most rely on and why? BH: One “go-to” for me is charting my pulse rate against my oxygen content. If my oxygen content is below my normal baseline reading and my pulse rate is above, I might try to sleep longer that evening to let my body recover a bit more. Hemoglobin is also a parameter that I pay close attention to, especially when I am at altitude. Since there is less oxygen, your body will try to acclimate by producing more red blood cells and hemoglobin. Ember lets me monitor my hemoglobin levels to know how long it might take at altitude for my body to achieve a benefit, if I’m overdoing it at altitude and how long the benefit achieved from altitude training may last. Finally, hemoglobin values can help guide your hydration protocol. A higher than normal reading often tells me I’m in a dehydrated state. DB: Can you summarize what you learned from your race at Kona this year? BH: Kona 2017 did not go quite to plan and hopefully with the data that I have collected, I will be able to zero in on a few of the issues I may have had in my lead-up. 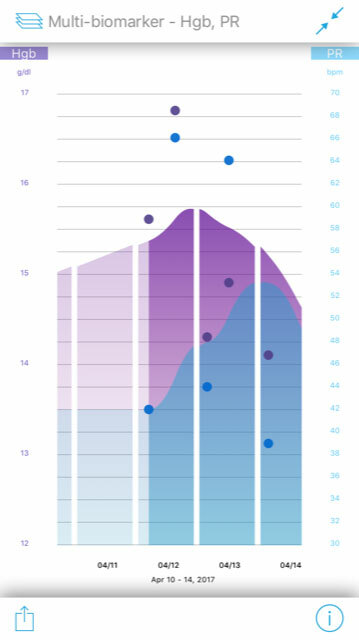 I’ve observed interesting trends that show I may have been a little more tired leading into Kona than during my IRONMAN South Africa block earlier that year. As race day approached, we noticed that that my hemoglobin was dropping slightly and my pulse rate was rising. This combination can be an indicator of being a little overtrained. Perhaps the additional stresses of Kona week were having a negative impact on my recovery, too. My coach and I will take these into consideration when planning the weeks before Kona in 2018, and I will work on additional recovery and hydration techniques. DB: Have you made any adjustments to your diet, equipment you use, or other elements of your training in 2017? Exactly how my hemoglobin and other parameters track in response to an IRONMAN training cycle. DB: What three things do you feel you and other endurance athletes should focus on most that pay the biggest dividends? Focus as much energy on your recovery protocol as you do on planning your workouts. This means proper hydration and fueling post-workout, using all the recovery tools at your disposal, and setting yourself up for a good night’s sleep. Train your mind nearly as much as you train your body. The key to breakthrough performance is unlocking your mental potential. Visualize, build resilience and support your physical effort with your mental effort. Consistency is everything. There is no magic training plan or solution. Create an environment, routine and support system that allow you to slug it out each day, thrive and succeed. DB: What “year-in-review” process do you recommend other endurance athletes go through? BH: Change is difficult, and historically the best athletes are the ones who can be honest with themselves about their weaknesses, develop a plan to strengthen those deficits, and then implement it effectively. Analyze what seems to work best for your training, recovery and racing. Understand where you fell short; then create a plan to attack and improve upon those weaknesses. Lay out a plan that is conducive to your lifestyle and goals in the sport, and (again) be consistent with everything you do—from diet to training to mental exercise to sleep and recovery. DB: What are you doing differently in 2018? BH: I will be adding more intensity earlier in my training and using Ember to help guide the recovery protocol during these larger training blocks. With Cape Epic (a seven-day mountain bike stage race) on my schedule in early March and IRONMAN South Africa a few weeks later, it has been necessary for me to train my body to perform day after day with residual fatigue earlier than usual. My parameter readings with Ember keep me confident that I am not overtraining; keeping within my own limitations. DB: What are you most excited about with training and competing this year? BH: Kona will remain my top goal this season, as the taste of success at that level simply makes me hungrier than ever to work harder and smarter in pursuit of my goals.